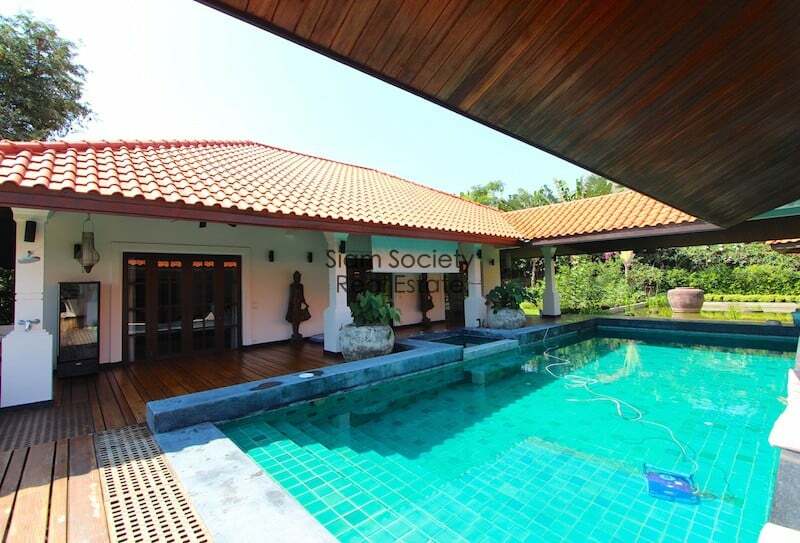 LUXURY BALI STYLE HOME IN SOUTH CENTRAL HUA HIN FOR SALE ON A VERY LARGE PLOT OF LAND WITH LUSH TROPICAL GARDENS. 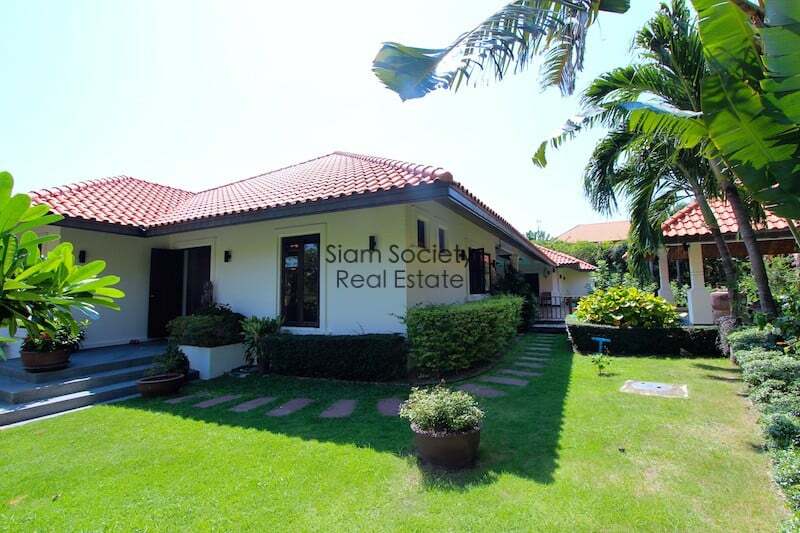 This is a must-see, beautiful home for sale, centrally located and within a well-maintained, high quality luxury development in Hua Hin. 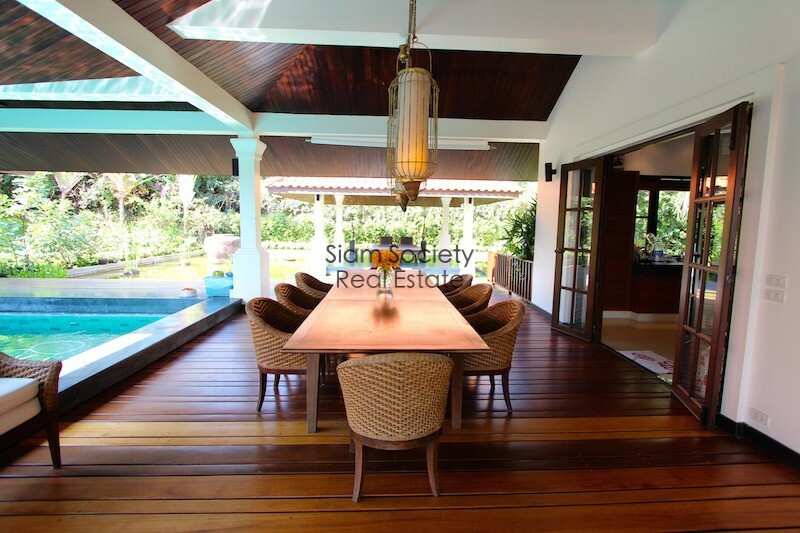 There are many lovely features in the property including beautiful hardwood floors throughout; wood ceilings in the entire home, inside and out; solid wood doors; and mosquito screens The home enjoys an elevated position for great views and a fantastic breeze throughout the day. 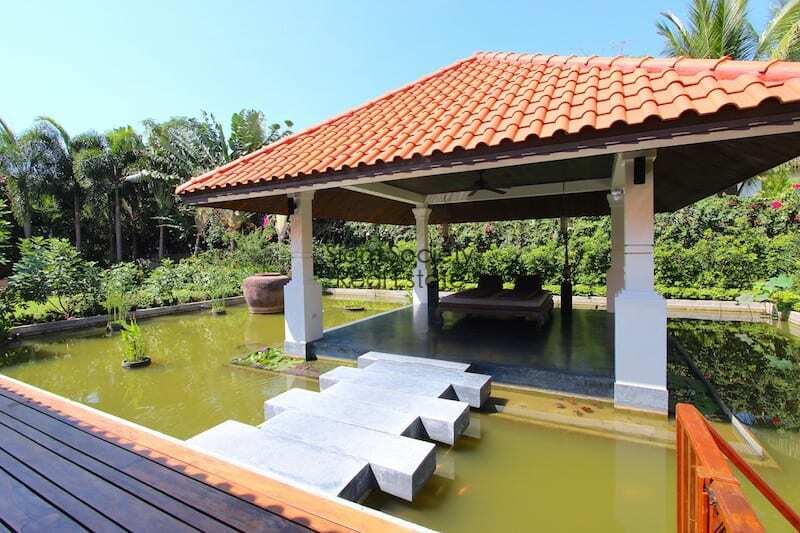 There is a very large garden with private lotus pond stocked with fish (great for eliminating mosquitos! 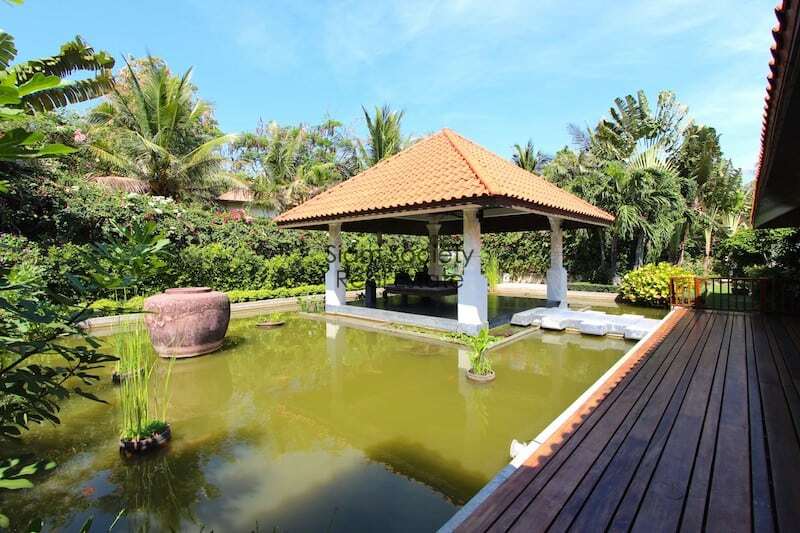 ); over the pond is a covered sala, perfect for massages and lounging in the evening. 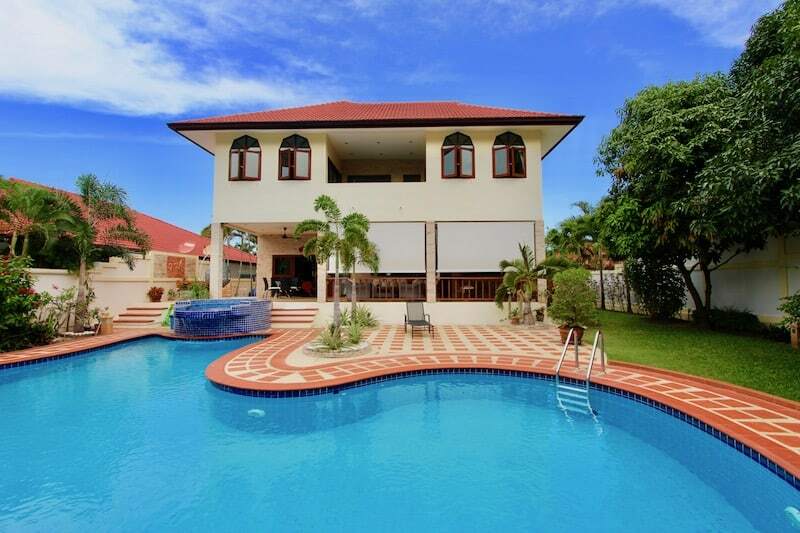 The home is designed to take advantage of the tropical outdoor lifestyle with a very large terrace separating the living areas and the bedrooms. On the terrace is a long saltwater swimming pool, various seating areas, ceiling fans, nice lighting and a beautiful dining table. 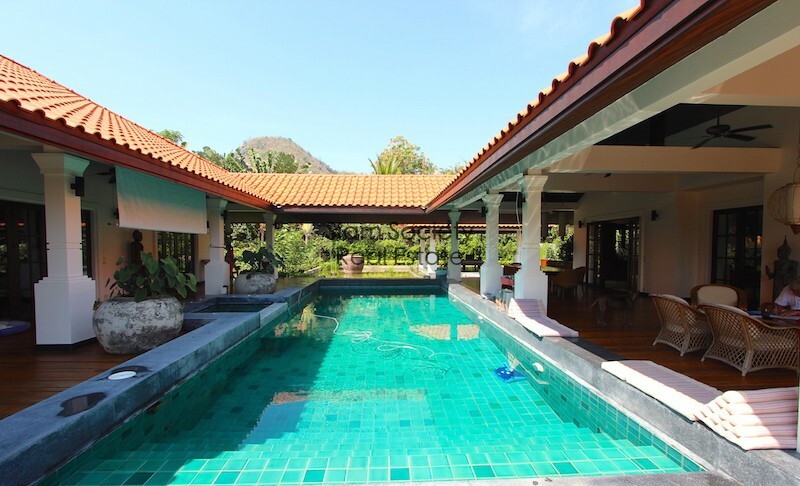 The home is designed for entertaining with a large stereo system outside and a projector screen over the swimming pool to allow for movie viewing and entertainment while on the terrace or in the pool. 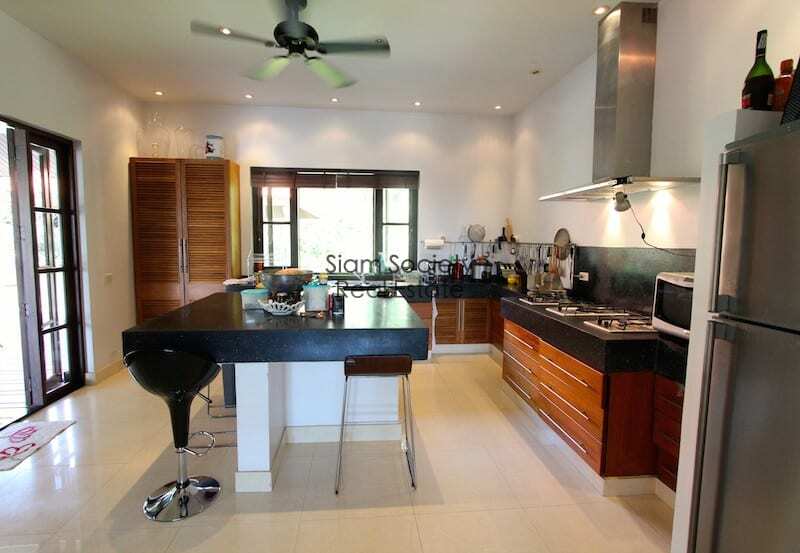 The kitchen is spacious and modern with high quality Franke appliances, a lot of light and ample storage throughout. 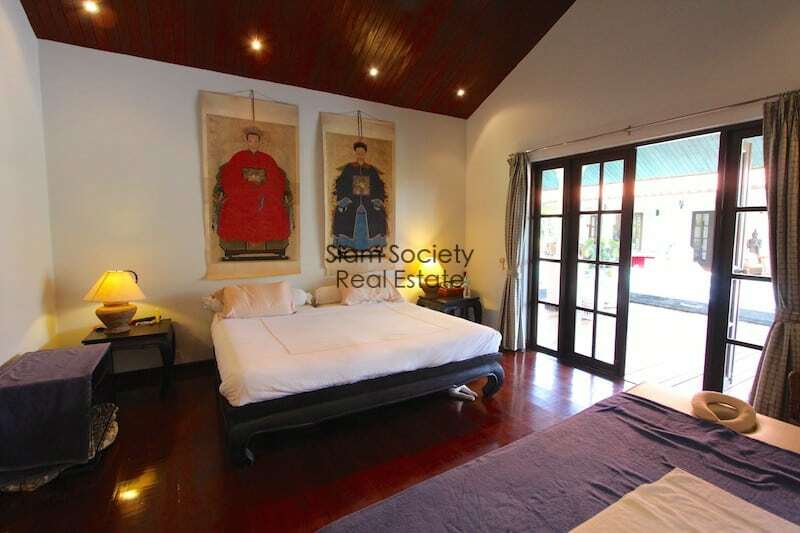 There is a formal entrance with a lovely hallway for displaying artwork, and to the left is a huge living room with more than enough space for an indoor dining room and/or office area. 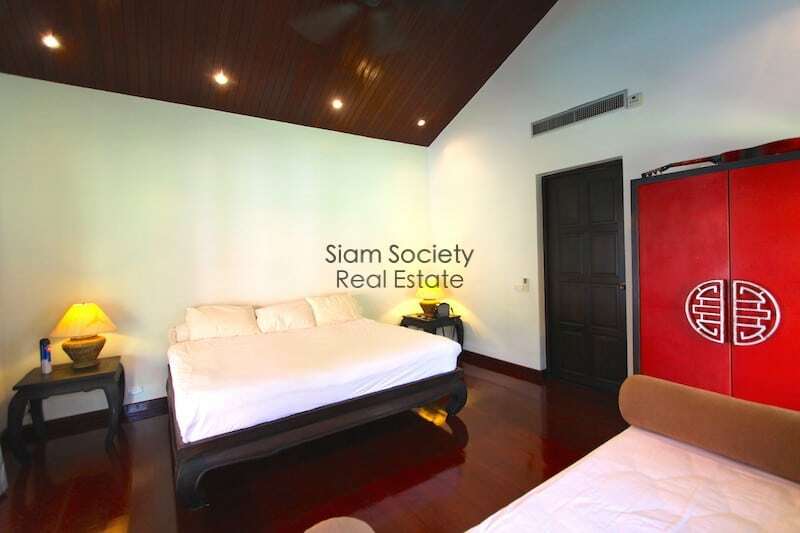 There are 3 good sized bedrooms, all with en suite bathrooms. The master bedroom has coved ceilings with wood feature, and a large, solid wood, built in wardrobe with vanity and floor length mirrors. 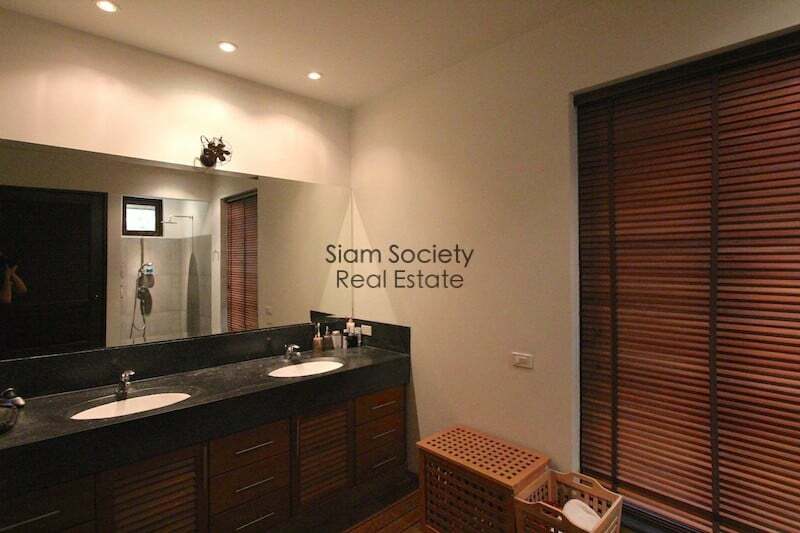 The bathrooms in all bedrooms have teak wood floors and tiled shower and toilet areas. The design and layout is simple, classic and elegant, and the home has a nice flow and great atmosphere. All rooms, including the kitchen, have air conditioning units. The property has 2 separate entrances with 3 spaces for parking, and an additional, large storage room below. 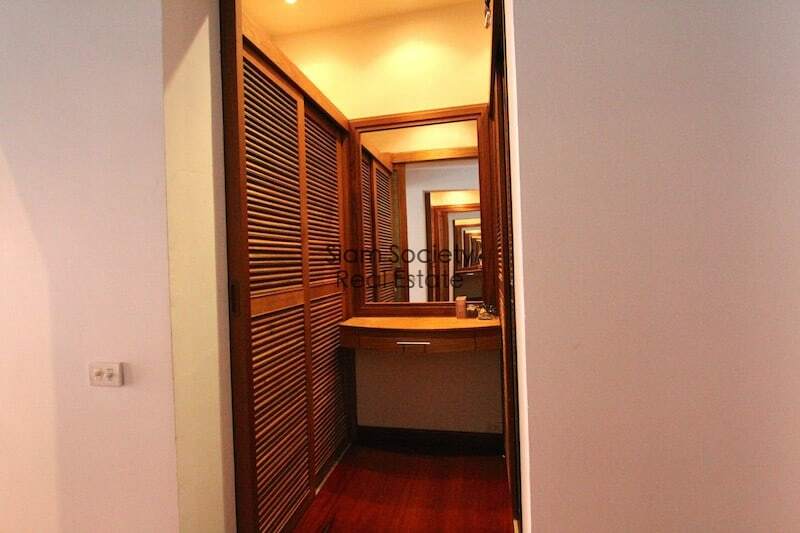 There is also a maid’s room and laundry and utility area. The property has 3 phase electricity. 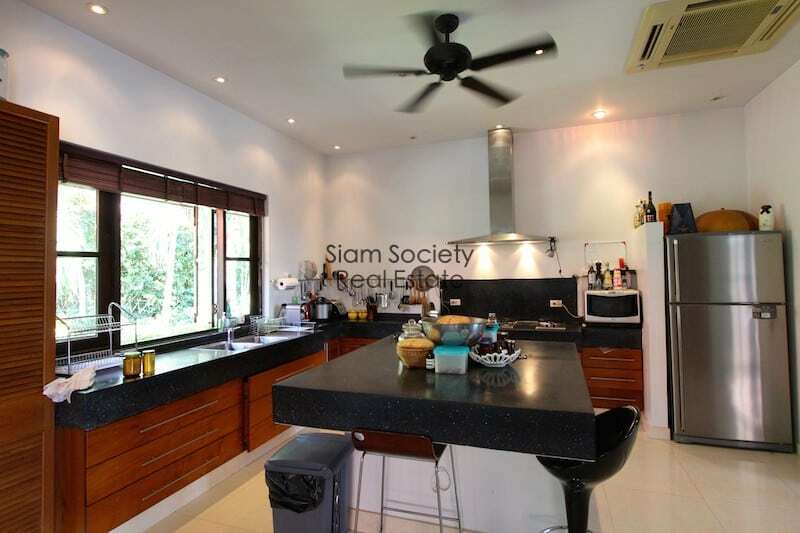 The home is sold unfurnished; furnishings are available for purchase for an additional 2.5 M THB.